Castaway Cay — one of Disney Cruise Line’s most popular destinations on Bahamian and Caribbean itineraries — is the perfect island retreat. And because your ship is (usually) the only one docked at the island, it is much less crowded than the public beaches you’ll find at other stops in the Caribbean. 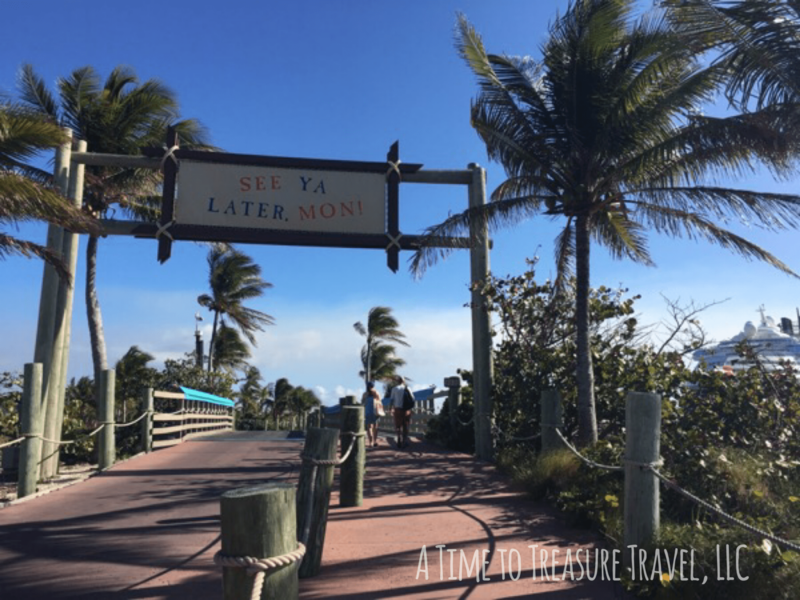 Here are 7 reasons we love Disney’s Castaway Cay! You can find characters for special Meet & Greets at various locations on the island. Disney photographers are on site to capture these memories and add them to your Shutters account. Often times, because other guests are out enjoying the beach or snorkeling, the lines are much shorter than for the characters on the ship! Your Daily Navigator will tell you where to find them and when. The all-you-care-to-enjoy feast you’ve been enjoying on the ship? That continues on Castaway Cay with Cookie’s delicious offerings. Thank goodness, because with all the sunshine and swimming, you can really work up an appetite. Those 18 and older can escape the crowds (and kids) and relax on the adult-only side of the island. At Serenity Bay, you’ll find a quiet stretch of beach, music, a beachfront bar, snorkeling area, and Cookie’s Too. We’ve already covered relaxing on the beach, but if you prefer to be a little more active, there is something for every member of the family to enjoy on Castaway Cay. You can rent snorkel equipment, bicycles, or a float/raft. Other options include a glass bottom boat ride, Castaway Ray’s Stingray Adventure, parasailing, paddle boating, kayaking, and more! If you’re traveling with children, this is where you’ll spend a good portion of your day. Most of the island’s activities are in close proximity to this area – the souvenir shops, rentals, hammocks, beach chairs, Scuttle’s Cove (kids’ club on the island, which is handy if you’d like to visit Serenity Bay), Snorkeling Lagoon, and the Pelican Plunge water play area. Start your day on the island with this FREE 5K run and take away a fun commemorative medal! It has the added bonus of easing the guilt of all the wonderful food and cocktails you’ve been indulging in. Register by visiting Guest Relations onboard any time before your day at Castaway Cay. There are two great spots to pick up souvenirs on Castaway Cay, She Sells Sea Shells…and Everything Else and Buy the Sea Shore. If you want Castaway Cay memorabilia – t-shirts, hats, pins, magnets, etc. – pick it up here! If you find that you need bathing suits, cover ups, sunscreen, or other beach essentials, you can snag those at the shops, too. You can only visit Castaway Cay with Disney Cruise Line. Contact your favorite A Time to Treasure Travel agent TODAY to book!